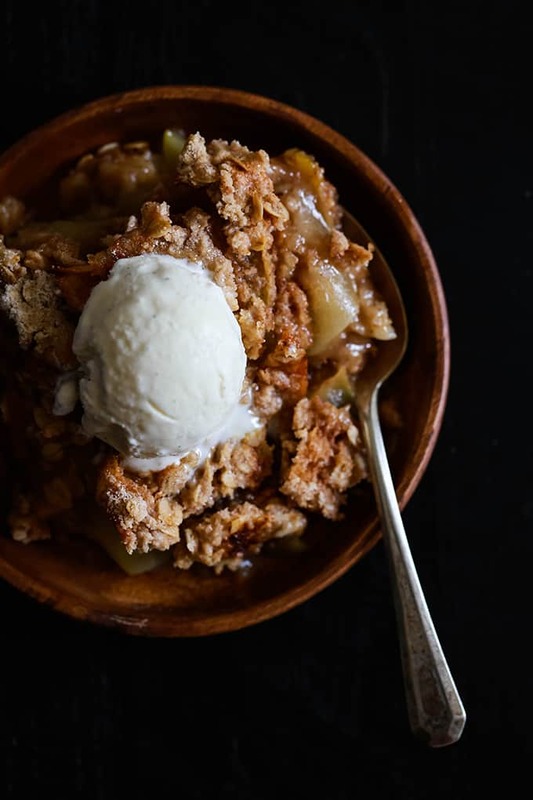 What’s the secret shortcut that makes my Snickerdoodle Apple Crisp so incredibly easy? A packaged cookie mix! Just 15 minutes of prep yields this must have autumn inspired dessert. Original content posted September 2017. Updated September 2018. In my last year of undergrad, I lived with three friends from my interior design program in an apartment downtown. On the third floor. With no elevator. At the end of a long day, walking up those flights of stairs was the last thing I wanted to do. But on occasion, an amazing scent would be wafting down the stairwell and it would make my feet feel a little lighter and carry me up the stairs a bit faster. My roommate Carrie would be making her dad’s apple crisp recipe which was absolutely out of this world. My Snickerdoodle Apple Crisp recipe is based on that amazing recipe of my past, but even more delicious. An Apple Crisp with Snickerdoodle Cookie Mix? YES! That’s my secret shortcut for this apple crisp recipe that takes just 15 minutes to prepare. Sliced Granny Smith apples are bathed in orange juice and sprinkled with cinnamon and sugar before being covered with a snickerdoodle cookie mix and oatmeal and drizzled in melted butter. 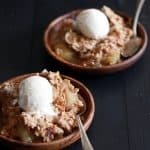 And yes, I guarantee that this Snickerdoodle Apple Crisp every bit as delicious as it sounds! 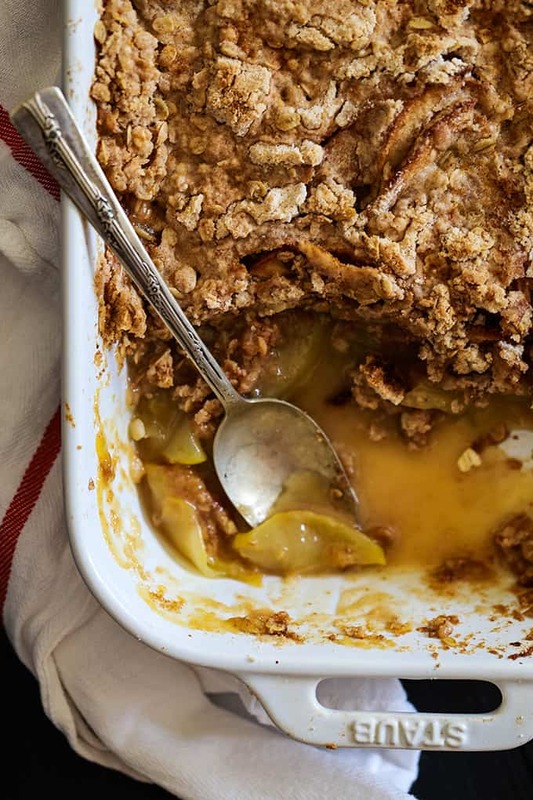 Do You Have to Peel Apples for Apple Crisp? If you have extra time on your hands that you just don’t know what to do with, go for it. As for me, in my kitchen I say no! It not only saves you valuable time in the kitchen, but the peels add a bit of color to your finished apple crisp as well. Peels also happen to be rich in fiber, vitamins, minerals and antioxidants, making them one of the most nutritious parts of a plant. Simply remove the core from each apple and cut into 1/4″ slices. The thicker cut slices mean you won’t have any mushy apples in your baked Snickerdoodle Apple Crisp. Instead, you’ll be left with sturdier slices that will no doubt hold up to that scoop or two of vanilla ice cream you’ll want to serve on top. This Snickerdoodle Apple Crisp isn’t my first foray into apple crisp creation, but it’s definitely my new favorite! I’ve also used my surplus of trick-or-treat candy to create my Halloween Candy Apple Crisp and spiced things up with my Mini Apple Crisps with Habanero Pretzel Streusel. 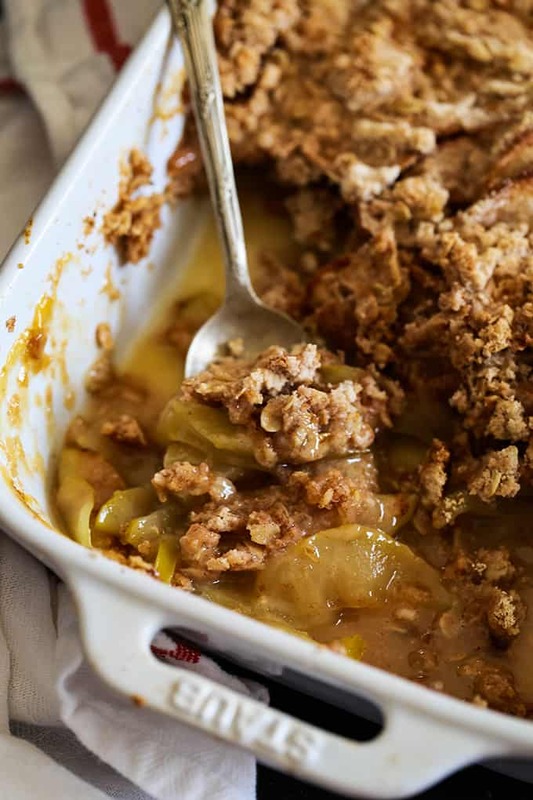 I also combined two favorite fall fruits in my Pear Ginger Apple Crisp with Shortbread Crumble. 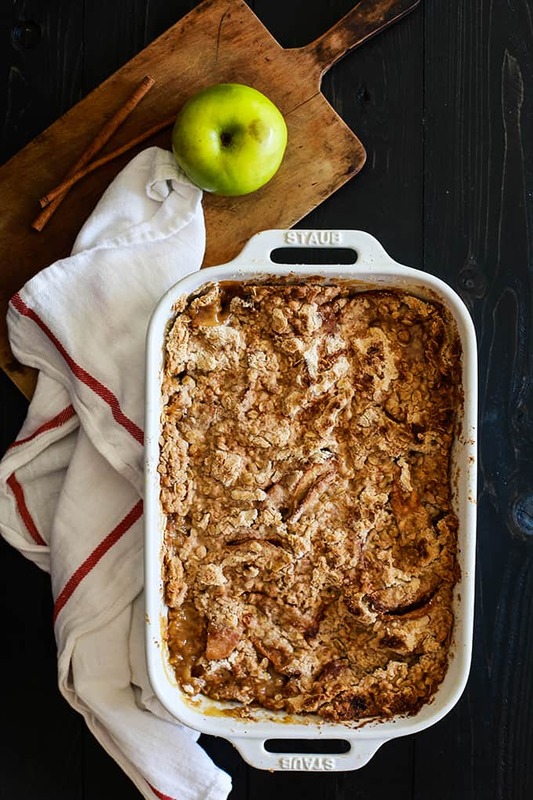 What’s the secret shortcut that makes my Snickerdoodle Apple Crisp so easy? A packaged cookie mix. Sliced Granny Smith apples are bathed in orange juice and sprinkled with cinnamon and sugar before being covered with a snickerdoodle cookie mix and oatmeal and drizzled in melted butter. And yes, it’s every bit as delicious as it sounds! Add apple slices into an even layer in a greased 9x13 pan. Pour orange juice over apples. In a small bowl, stir together sugar and cinnamon. Sprinkle evenly over apples. Stir together cookie mix and oats in small bowl. Spread evenly over apples. Drizzle butter over cookie mix and oat mixture, so that no dry mix is visible. Bake for 60-75 minutes or until topping is golden and apple mixture is bubbly. Looking for more sweet treats to utilize your bounty from the orchard? You’ll no doubt love this Simple Apple Tart, decadent Caramel Apple Rolls or these mashup Apple Cheesecake Shortbread Cookies. I am going to try this recipe this week. We have Honey Crisp apples, will they work or become mushy? Hi, Pattie - I haven't tried this recipe with honey crisp but you should be okay! If I make a day ahead of time to bring to a friends will it still taste as good without being hot out of the oven? Do I need to refrigerate it as well? Thank you for your help!!! Hey, Pattie - It will be fine, but maybe not "share it with others" worthy as the crust won't be as crisp. If possible, I'd bring it warm or made the same day. Wow, that's a great dessert! Love this. I'm sure this is incredibly delicious! Definitely one of our favorites, Chrissie! I want to eat this dessert every day! So pretty! Good idea! Looks very tasty! I am going to make this! This recipe really impresses! I really like! Thank you. My husband wishes I made it every day! It definitely disappears fast at our house, Erin! This is a great way to enjoy apples! Looks so yummy! The perfect dessert for this time of year! Love Apple Crisp!!! This looks so delicious! I love this snicker doodle twist on one of my favorite treats! Can't wait to wow my family with this one! The only thing better than one dessert is two desserts in one! Snickerdoodles combined with apple crisp is a genius idea! Seriously so perfect for the holidays. YUM! Totally agree! Thanks so much for your kind words! Hi, Kristina - Do NOT follow the instructions, simply use the dry mix and included spice packet as an ingredient to mix with the oatmeal. Let me know what you think when you give it a try! I'm so excited for apple season. This looks amazing. Thanks so much, Paula - hope you'll give this a try! I love apple crisps. They are so easy to make and so decadent. Your recipe looks awesome! That reminds me of my childhood! Looks fantastic! That is a perfect delicious fall dessert! 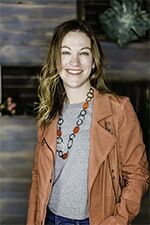 Hi, Becky - I used a Betty Crocker mix that I found at the grocery store. You can see what it looks like on Amazon, here. How YUM is that?! I want a big serving of it now! This dish have every flavor I love about fall in one place! So good! It's definitely my new favorite apple crisp, Dorothy! 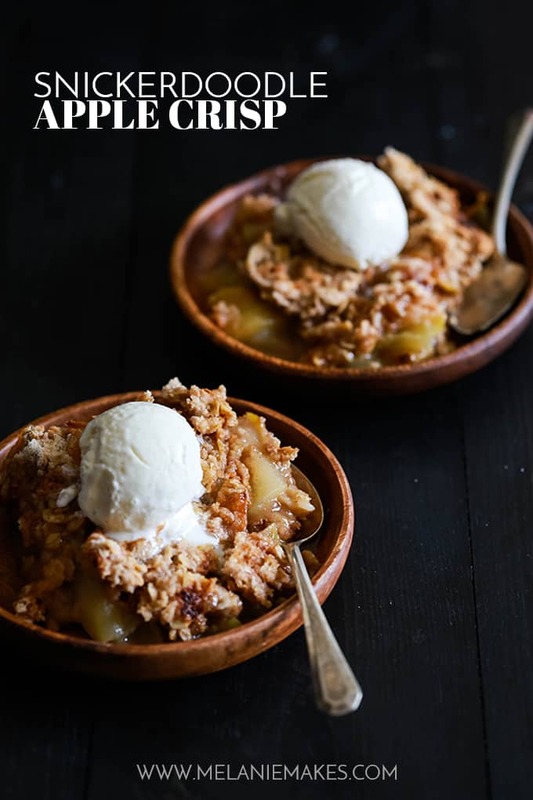 Apple crisp is my favorite fall dessert! One of mine too, Amanda! This looks delicious! Did the original recipe use a mix? Would love to see it if not, we have some food allergies and would make it easier to adapt. Hi, Lea - No, the original recipe was a mixture of flour, sugar and spices. I just took a shortcut!